Könchok Yenlak was born in Kyen in the upper region of Kongpo in 1526. He was recognised and reinstated as the Fifth Shamar incarnation by The Eighth Karmapa, Mikyö Dorje. Könchok Yenlak studied extensively with the Eighth Karmapa as well as with the Karmapa’s disciple, Pawo Tsuglag Tengwa, becoming a renowned meditation master and scholar, whose writings filled many volumes. He received the full transmission of the Kagyu lineage and was empowered by the Karmapa as lineage holder. 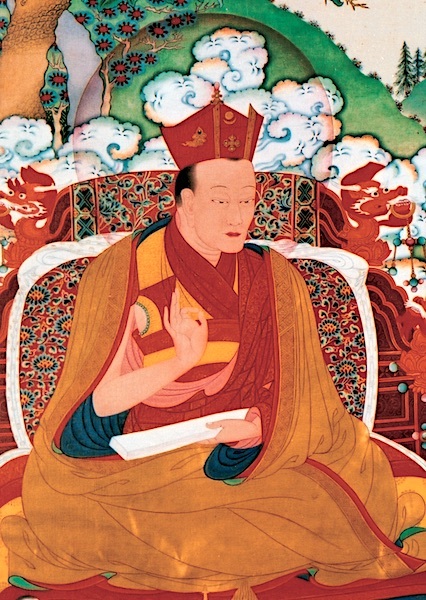 Könchok Yenlak recognised the Ninth Karmapa and offered him the full lineage. Accompanied by many signs of realisation, he passed away at the age of fifty-seven in 1583.